Frequent trains run from Glasgow, Edinburgh and Stirling stopping at Falkirk High Rail Station, Camelon Rail Station or Larbert Rail Station. Consult Scotrail timetables online, click here for more information or call National Rail Enquiries: 08457 48 49 50 or Traveline Scotland: 0870 608 2608 to plan your visit. 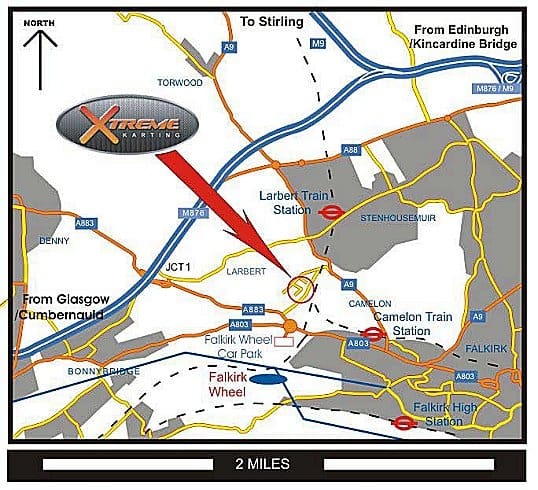 Larbert / Camelon railway stations are approx 1 mile from Xtreme Karting (20 minute walk). Taxis are usually available at all stations (approx £3) or contact us for local taxi firm numbers if you wish to prebook.